There comes a point in everyone's life when nothing else matters except the pursuit of a good lunch. During our Independent Bookshops Week bookshop crawl, that point arrived mid afternoon, somewhere between Haslemere and Petersfield. We went from being fun, happy-go-lucky bookshoppers to ravenous beasts, the desperate need for food pushing even the excitement of books out of our minds. Fortunately, the next stop on our crawl had been recommended to us not only as a bookshop, but as a cafe. Which meant we were on a mission to find One Tree Books, marching through the Hampshire town at top speed to find food. We weren't disappointed. The bookshop has a large street presence, but inside it's even bigger, covering two floors, with half the ground level given over to Madeleine's Kitchen at the back. At first glance this may disappoint the casual bookshop visitor, but anyone with enough hunger pains (or even just a sprinkling of sense) could tell you the balance between the two halves is spot on. We chose a table to the side of the room, which meant we were perfectly placed to observe areas of the bookshop while relaxing in the welcoming atmosphere of the cafe. 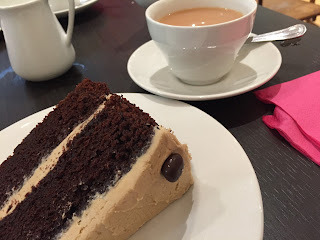 The staff were friendly and the food was divine: naughty and healthy at the same time, accompanied by delicious smoothies and rounded off with tea and cake. It was a leisurely lunch that was too good to rush and is the reason we ran out of time to visit all the bookshops on our itinerary. Refuelled and refreshed, we had the energy to return to the task of the day: bookshopping. While in the cafe, we'd enjoyed the sight of the bookshelves, which looked as though they were ready to cross the border into the cafe at any moment. Bookcases and tables fill the front half of the shop, crowding it with bookish treats without being too crammed in – One Tree Books really does have a luxury of space. 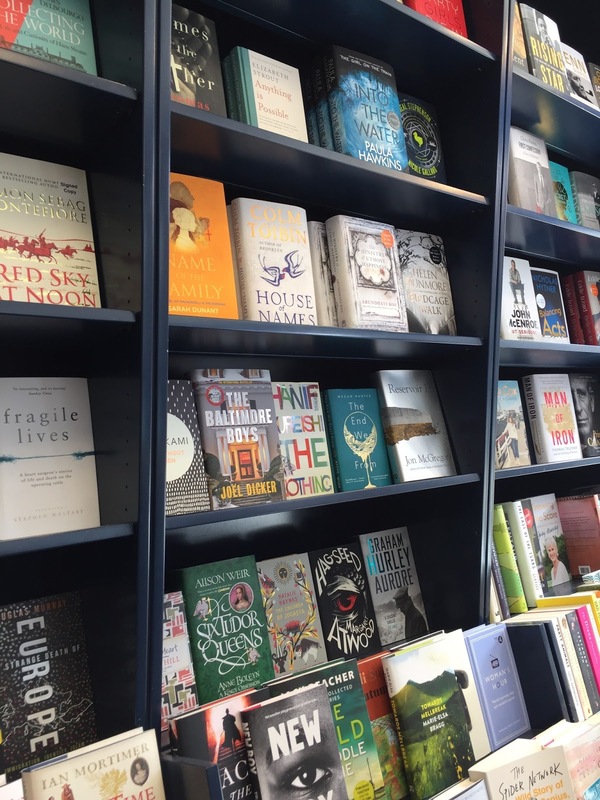 Fiction is on the ground floor, with a good sprinkling of non-fiction, children's and recommends, and games too, meaning many browsers may not feel the need to venture upstairs, where more treats of books, games and jigsaws (I love jigsaws) can be found. Tempted as I was by a jigsaw, I dragged myself back downstairs empty-handed. Instead I opted for a non-fiction read, because I've heard lots of interesting comments about Sapiens by Yuval Noah Harari and by now we'd realised exactly how long we'd loitered over lunch. 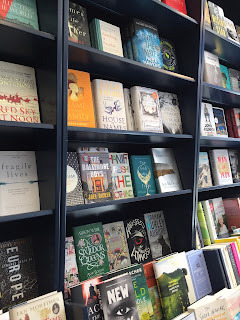 I was sorry to rush off, because it meant I didn't get the chance to ask why the name One Tree Books was chosen, but we'd enjoyed more than our fair share of time browsing the bookcases and devouring our lunch, so I can't really have any complaint. One Tree Books in Petersfield was the perfect balance of bookshop and cafe, feeding mind and body, and the next time I find myself hungry in Hampshire, I know where I'll be going.